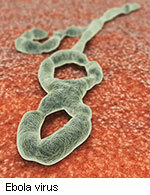 Ebola has broken out in the Democratic Republic of the Congo, according to the World Health Oganization (WHO). The African country’s Minister of Health notified the WHO of laboratory-confirmed case of Ebola Thursday, before the organization notified the public via a tweet on Friday, according to The Washington Post, CNN, and other media. The Democratic Republic of the Congo had been tracking an outbreak of hemorrhagic fever since April 22, when officials first identified 9 “suspected” cases of Ebola. The patient who tested positive died, as well has 2 other people identified with a fever. Of 5 blood specimens taken from suspected cases, only 1 tested positive via real-time polymerase chain reaction (RT-PCR) testing, according to a statement from the country’s Minister of Public Health. According to The Guardian, the country last had an Ebola outbreak in 2014, which was shorter and less extensive than outbreaks affecting Guinea, Liberia, and Sierra Leone at the time. The country’s Ministry of Health said it is currently tracing contacts of the infected patients, while the WHO has urged organizations such as Doctors Without Borders to give aid. Teams of epidemiologists, biologists, and public health experts should reach the area Friday or Saturday, according to the WHO officials. The residents in the area of the outbreak live in a remote part of the country, which the WHO officials believe may help contain the disease.